Years ago, Down The Hatch was the name of the place the couple who own the house met. 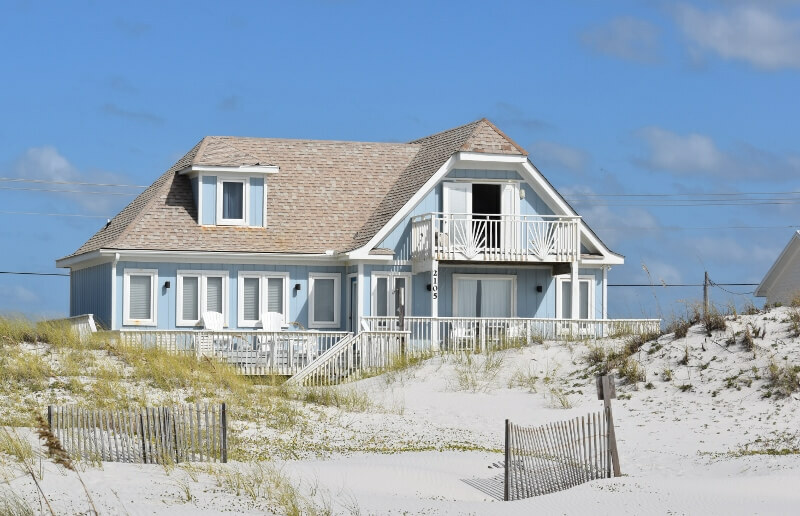 When they found this house on their favorite Gulf Shores beach, they christened it by the same name that held so many good memories. Hopefully, Down The Hatch will be a place that is the start of happy memories for you as well. Come enjoy 4 spacious bedrooms, 4 baths, a gracious great room with a large harvest table, and porches that perch just steps from a beautiful sugar-white beach. Oh, and you have a 100' stretch of gorgeous quiet beach. The Main Floor King Master has an en suite private bath. 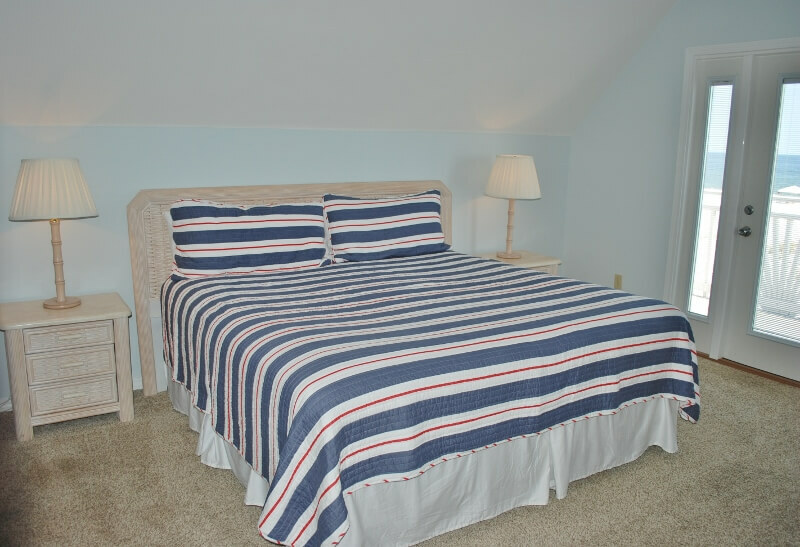 The second bedroom on the main floor has a pair of twin beds. There is a second full bath in the hall, and a laundry, on the main floor. The top floor has a second king master with an en suite private bath and a beachfront porch. The second top floor king bedroom has a full bathroom across the hall. 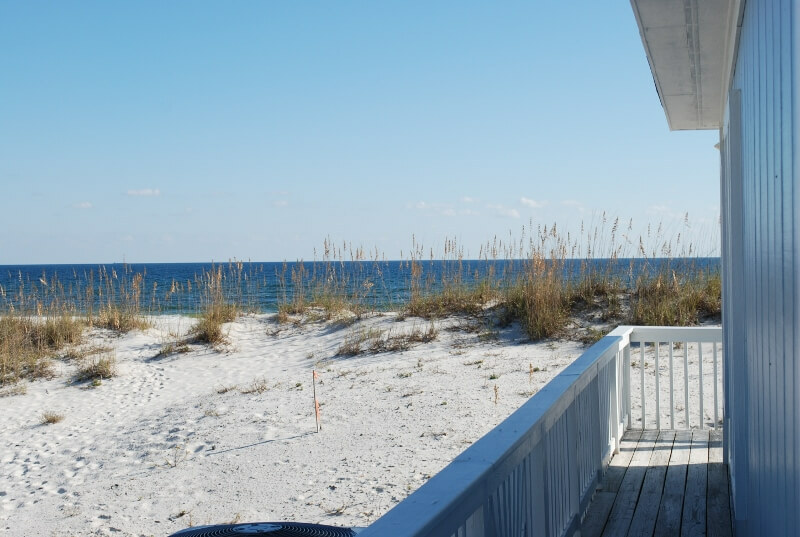 Great porches offer amazing views of Gulf Shores sugar white sand beaches. This quiet area of West Beach has a single row of beachfront homes, plus a single row of homes on Little Lagoon. 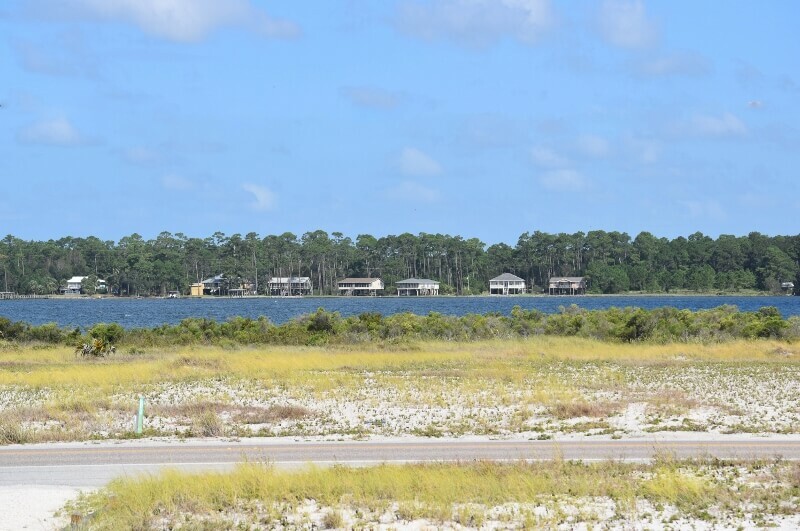 It is a wonderful, quiet area of the beach but it is less than 4.2 miles from the heart of Gulf Shores. Undeniably the best place in GS. The house is amazing and beach access is perfect. Star gazing at night is fabulous with the Milky Way visible later. Very nice beach house for 2 families. Plenty of room and we were not stepping on each other all the time. Very clean and well kept. Thank you. A great place for our family. 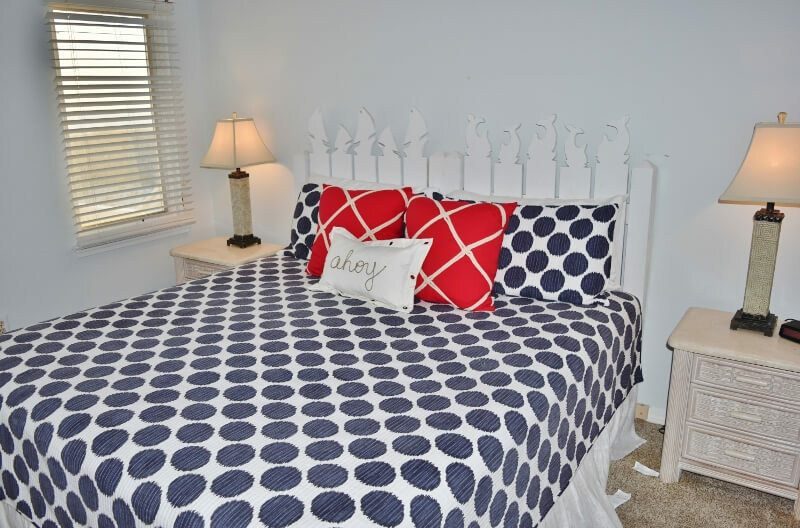 The house is very well maintained and equipped with everything we need. Geoff and Susan are always so helpful when we need assistance. Our family looks forward to our 4th family vacation to Down The Hatch. Enjoyed the stay very much. Our 1st visit to Gulf Shorea. We have vacationed in Destin a few times and usually go to either Cocoa Beach or St. Pete’s. Gulf Shirea was a nice change. The Down the Harch rental home worked very well for our family. We have rented Down the Hatch three times over the last few years and each time it has been the perfect beach house for our group. Location is great for beach fun, shopping, and restaurants! The beach house is spacious, always super clean, and literally steps from the whitest sand you’ll ever walk on. It’s always hard to leave, but we know we’ll return for another great vacation at our favorite beach house! This house is on a very quiet and beautiful white sand beach. Perfect location and plenty of room for our family of 12 (kids and adults). Only a 5 minute drive into the heart of Gulf Shores if you need to go there for any reason, but far enough away from the crowds to feel like a semi-private beach. We stayed at Down The Hatch for the entire month of January. The house is beautiful and very close to the beach. The furniture in the house is very comfortable as is the deck furniture. The only complaint we have is regarding the TV in the living room. Although we didn't go to the beach to watch TV, when you have a bad weather day, a TV is helpful to have. It's impossible to figure out the channel system and the sound is terrible! I also had 2 reps from the realty company try to help and they couldn't figure it out either! The only other suggestion I have is that the cookware is awful because the teflon is peeling off. But, we loved the house, it's cleanliness and proximity to the beach. Susan and Geoff were attentive to our needs and easy to work with. We will be returning to this house as we loved every minute of our stay! We always enjoy our time at Down The Hatch so much that we always book for the next year on our last night there. The house and beach are wonderful. A big Thank You to JEFF at the property management office for his help. The fourth time to rent Down the Hatch and the family had another great stay. It was an awesome time to relax and make wonderful memories! The house was so cozy and being right on the beach was incredible! We were blessed with such great weather, gorgeous sunrises and sunsets!! 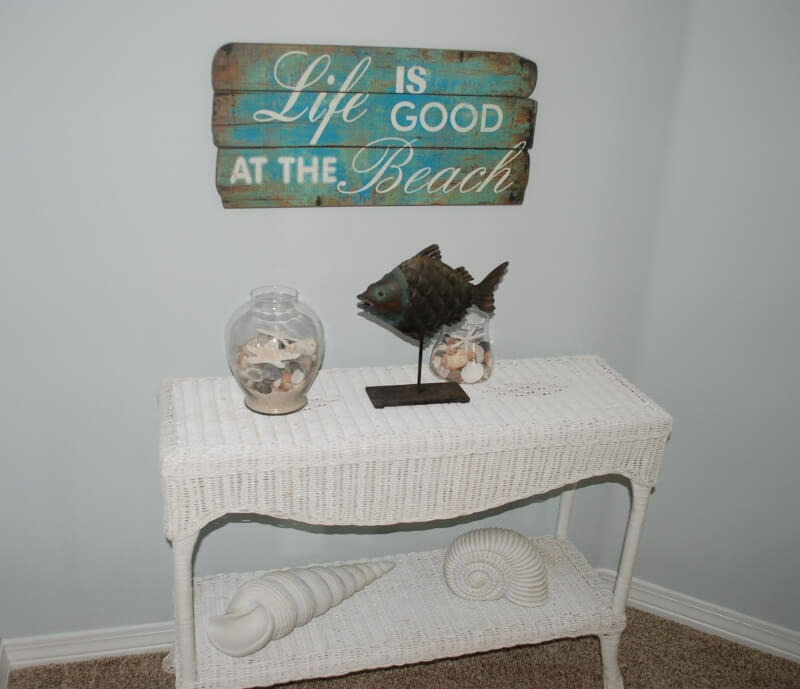 The Perfect location on the Gulf Shores!!! Highly recommended!! We chose to come to the Gulf Shores to get a away from the beach traffic in Florida. The Down the Hatch location is just perfect, it is located far enough down the shore that it has a private beach. We felt like we had an entire ocean to ourselves for most of our vacation. It is also close enough to town that we were able to make multiple trips to the grocery store that is only 10 minutes away. Not to mention the views at this site are spectacular!! The intercostal is so close to you on the north side of the house and obviously the ocean steps away from the back deck. My kids were able to set up a sand play area right at the bottom of the back deck which was perfect so we did not have to worry about them being near the ocean if we were making breakfast/lunch etc. The house itself was plenty big for 3 families with small children, large dinning room table and big kitchen to cook breakfast, lunch, and dinner. We will go back again!! Down the Hatch - perfect beach get away! We have rented Down the Hatch for several years now. I have never had a bad experience. The house is decorated nicely and the location is perfect. We were lucky enough to have great weather during our stay and see dolphins every day! Absolutely the best time of year is early November in Gulf Shores. Weather was perfect with no crowd whatsoever. Please call us if you feel something is not up to your standards! We will come and make it right! Our Stay at Down the Hatch! Fun was had by all! House well stocked with kitchen and BBQ gear! Pleasant surprise of full soap dispensers at every sink, including the kitchen sink! House was the perfect size for our group! Only downside...washing the towels before we left, but it worked out just fine (haven't had to do that at other beach houses)! Great location...close to town, but away from the crowds! We rent Down the Hatch again! We had a great time! Good location. Good size rooms. Private beach area (not many people around) Beach chairs were great to have. The outdoor shower was very handy! When it is 95 degrees out we don't keep screens on the windows--in the dead of summer, if you leave the windows open to hear the waves, the air conditioner will freeze up and it will be 90 degrees in the house. When you have to be without air conditioning for an extended period while it defrosts, you will not like the house nearly as much. 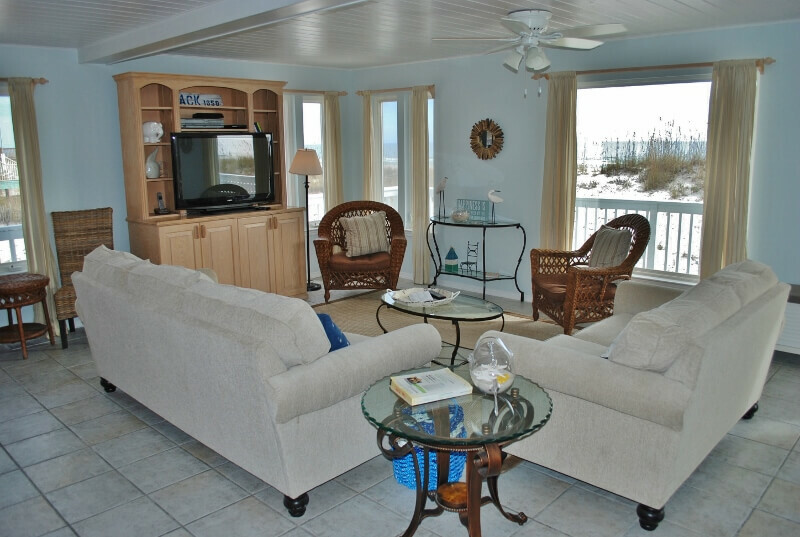 We hope you'll enjoy the sounds of the waves from the porches! Renting on line can be a risky business. 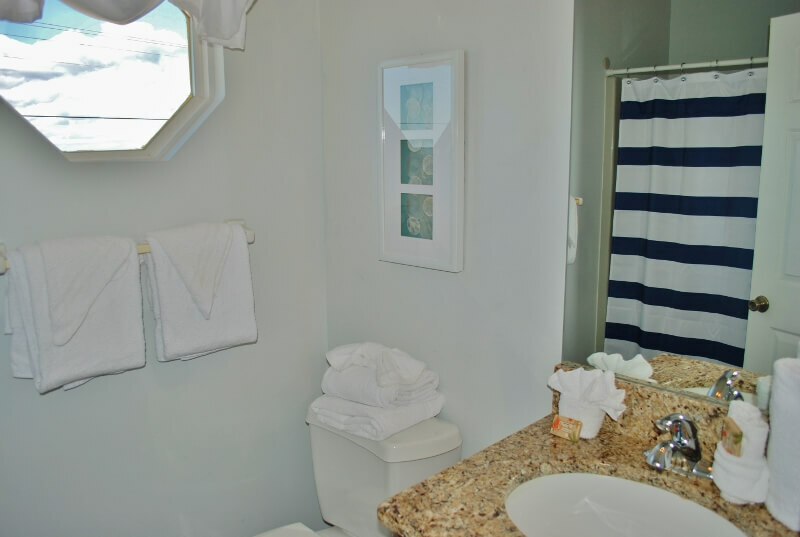 Down the Hatch not only sleeps 10 comfortably but is completely stocked for a large family. Dishes, cutlery, pots and pans, small kitchen appliances, plenty of towels, everything we needed. The home is in good repair, hot water heater and AC ran smoothly and the outside shower helped keep down the amount of sand brought it. I would highly recommend this rental property. The place is amazing. Breathtaking views of the beach every day all day and night. Peaceful and quiet with plenty of room for everyone. Great family eating area and most importantly a bathroom for every bedroom! The family had a wonderful week. This was our 3 time to stay at Down the Hatch. Great house -- good layout, size, location,and condition. We are a group of 4 men who graduated college together in 1963. Seven years ago we started meeting annually in the winter looking to get relief from the cold and to resolve most if not all the problems of the world in a 3 to 4 day span. We have been to San Antonio, Tucson, San Diego, Charleston SC, Smoky Mtns Natl Park and South Padre Island. Our rental at Down The Hatch has been the best in every regard: 4 bedrooms with bath at each, well appointed living space, abundant cooking appliances and eating utensils, immediate access to the beach, perfect weather, convenient distance from an airport, restaurants of every stripe and even fantastic football games Saturday evening, although maybe the rental can't claim credit for that. This has got to be a fantastic rental in the summer. Some of the blinds on the windows could use repair or replacement. The open/close rods were missing, as were the open/close rods on the windows themselves. We just opened the doors to get the indoor temp and the air we wanted. But aside from those small things, we found this to be our best stop yet, and are considering coming back next Winter. We had a beautiful family get together from 3 states. The house and location were the perfect place to meet. We liked the laidback, somewhat private location. We had some rainy days but also enough beach time to make everyone happy. We planned to explore some of the regions activities but were so happy there that we found it hard to leave. I would definitely recommend this rental and if we get a chance to come back...we know where we will stay! Our family enjoyed our stay at Down The Hatch so much that on our last night of vacation we booked our next vacation. Down The Hatch provided just what our family was looking for, rest and relaxation, and the opportunity to make a lot of memories. 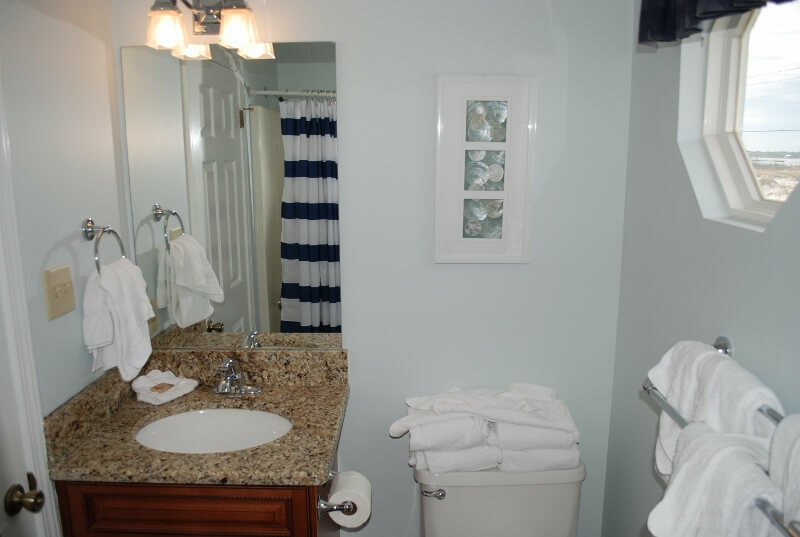 This property was very clean and nicely updated. The location was perfect with the beach directly off the back deck and very little traffic noted on the road in front of the house. The furnishings were comfortable and the kitchen was nicely equipped with everything we needed. The property managers were very professional and they quickly responded to our communications and questions. We would gladly recommend this property to others. Very clean with nice furniture, appliances and decor. Perfect location on the Gulf beach. Very professional management with prompt replies to questions and requests. Staying at Down the Hatch was an amazing experience. Great location. Plenty of space. Beautiful accommodations. Close but not too close to attractions. Any issues and questions were answered very quickly. We enjoyed eating at The Hangout and other local restaurants. Our teenagers loved the local go-kart venue. We also bought local seafood to cook ourselves that was very good quality. We had a very good time and would highly recommend this house. Very nice home clean well maintained. Washer dryer needs to be updated. AWESOME location very quite and relaxing( even during spring break).Only down side weather was terrible all week, but did get enough breaks to score some quality seashells due to rough seas. Susan was excellent to work with thru out the whole process. WOULD HIGHLY RECCOMEND THIS RENTAL COMPANY. Perfect house for 4 couples. Well stocked kitchen. Master bedroom downstairs had comfortable firm mattress. Master upstairs had soft mattress. Plenty of seating indoors and out. Great communication from management company. Great house, location, view. No complaints. Just wonderful! We love every minute of our vacation from the location, to the beach and water, to sitting on the patio seeing the full moon over the Gulf, the dolphins jumping. It was just the best! It was a wonderful house. We had a wonderful time and we hope we can go back some day. Down the Hatch was the nicest beach house we have ever stayed in and we have stayed in many. It was beautifully decorated and clean. It was well stocked with everything we needed and even included some little extras that we have never had in previous beach house rental. All the little extra touches made us feel very welcomed. The location is absolutely perfect - past the last condo on West Beach Blvd. and very private. Some days we didn't see more than 15 other people on the beach. And yet it is just minutes from shopping and eating. The staff was very attentive and stayed in touch through email or text almost on a daily basis. The only issue we had was the firmness of the king beds (the twins were fine). We had to purchase a foam topper to make it all week without aches and pains. However, that could just be a personal preference. We will definitely haul our mattress topper back to Gulf Shores and stay at this beautiful home again. The house was just perfect for our family. We had everything we needed and more. Perfect location---peaceful , beautiful, private---close to town and other activities. This was one of the best beach trips for the Ferguson family. The house is in a great location and in good condition. We will return to the beach next year and use the same house. Wonderful location - near to downtown but far enough away that we almost had the beach to ourselves. The property management staff responded quickly when we had a minor problem with a DVD player. The house was clean and well stocked when we arrived. 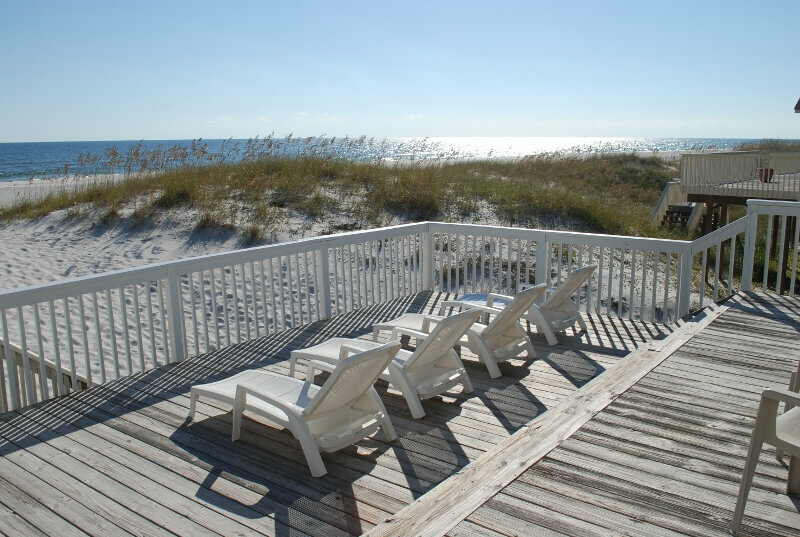 Altogether, it was a great place to relax and enjoy our stay in Gulf Shores. I would definitely recommend Down the Hatch! DESPITE A LITTLE COOLER WEATHER FOR WEEK 1....the additional climate was pretty pleasant for the rest of January....The house was exactly like we expected....equipped with everything...clean...We wnjoyed walking the beach, and golfing and eating at all the local restaurants...Only neg. was the wireless internet kept going in and out...and we do work on our computer while we are on that was a problem...rental company tried to do whatever they could. We had a great time! Walk out the back door to the beach and the town was close enough to run to the grocery store quickly. The house was nicely decorated and very comfortable. This is our 4th year to rent in Gulf Shores, each time at a different location. This house was one of the best. We had a small misstep in no internet service which was essential but the homeowner did everything possible to remedy the situation, unfortunately it was not able to be fixed. Great lay-out and great location. Extremely well decorated, clean and comfortable. Our family of 9 spent the week in "Down the Hatch". As soon as we walked in the front door we felt comfortable. Everything you would need for cooking is provided and all appliances were in excellent condition. The view from the back deck is beautiful. This home is located farther out of town so it is very quiet and relaxing. Our beach area was never busy. Watching the dolphins in the morning was wonderful. We will most certainly go back! This was our first family vacation and we were not disappointed! The house was beautiful, equipped with everything we could possibly need. The owners were exceptional to work with. We loved the location, close enough to activities but far enough away to be private. We literally only saw 5-10 other people on the beach. Would definitely recommend this rental property. We hope to return next year! Down the Hatch was a great place for my family to relax, unwind, and spend time making memories together. Our kids (10, 6, and 4) had fun collecting seashells, jumping into waves, and building sandcastles. We loved how close all of the attractions were, and would stay again in a heartbeat. Thanks! This was my second time to stay at Down the Hatch and have reserved it for next year. My family loves the location and the bedroom setup works well for the family. Look forward to staying at Down the Hatch next summer. Fantastic House, clean house, empty beach, Great times. We can not wait to get back next summer! I sent a long email to Susan and Goeff at GSVacationRentals. Please refer to them. As soon as we found "Down the Hatch" online, we knew this was going to be a perfect beach house and it did not disappoint. Our own private beach just steps from the porch; white, sugary-like sand between the toes; and blue herons that greeted us at the water's edge each morning. The house itself totally fulfilled our needs and wants. It was immaculate, beautifully decorated and had everything we needed. Each bedroom had its own bath and the living area provided a wonderful view of the gulf. From the time we made our reservation until our departure, the management staff was cordial and helpful. We booked another night after staying there several nights simply because we could not bring ourselves to leave. Will definitely return! Our family had a wonderful week at Down the Hatch. The weather cooperated so the kids spent hours in the water. Grandparents sat under the rented canopy and watched them. The beach is beautiful and this section was very quiet. Couldn't have had a better time. Took a day off from the beach to visit Fort Morgan. The house was perfect for us, very clean, well maintained, with everything we needed in the kitchen plus plenty of linens, paper goods and cleaning supplies. We have booked a larger house for next year through the same Management company. We were very happy with their service. Family from Birmingham AL joined us for a great beach experience. Quiet area, beach just steps away, plenty of room for the kids... it was one of the best family vacations we've had. This will be one of my favorite vacations. We had 4 couples staying at the house which was very adequate. The floor plan is wonderful. Views are amazing. The open floor plan made it comfortable to have many conversations with others. The table seats 10 which is not common in rentals. This was one of the things we enjoyed most. We sat around this table and shared meals, stories and laughs. The decks are plentiful. The owners have the house more than adequately supplied. We had everything we needed. The house was neat, clean and furnishings were very nice. I will definitely come back to "Down the Hatch"
Perfect house layout for our party of 6 adults and 3 kids. Beautiful view and beach location. The layout of the house was perfect and the house was clean and well-maintained. We watched dolphins, loved the clean white sandy beach and really enjoyed the great location of 'Down The Hatch'. Being ON the beach was great for the kids. We would definitely return. Nice quiet area. We really enjoyed staying here. Very clean and well stocked met all our needs. Private beach and even though we stayed during Spring Break, we were not bothered by the Partiers.